Dogs and Cats are Affected by Skin Problems and Allergies Too! At Tri-County Animal Hospital, we see pets with skin problems and allergies, including food allergies, on a daily basis. These problems can make both you and your pet miserable. Allergies in dogs and cats are treatable conditions that often show up as skin or ear problems. Common skin diseases we see on a regular basis include allergies (atopy, food allergies, flea allergies), hair loss in cats and dogs, nail and nail bed disorders, Demodectic Mange, Ringworm, and itchiness in dogs and cats. 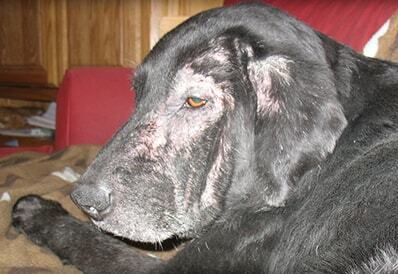 Skin conditions are some of the most common ailments of both dogs and cats. Dr. Silberman and the staff of Tri-County Animal Hospital are experienced in curing a myriad of dermatological issues and have had great success with treating dogs and cats with skin diseases. in the tri-county area. Apoquel is a fast acting, safe, new treatment for the control of acute and chronic canine itch and inflammation. Tri-County Animal Hospital is one of only a few animal hospitals in the tri-county area that has Apoquel. Owners of itchy dogs treated with Apoquel reported a significant decrease in their dogs’ itching 24 hours after giving Apoquel. Apoquel can be used in combination with other drug therapies, depending upon the underlying cause of your pet’s itching. Please call us today for an appointment so that we may examine your itchy dog. Ear infections in dogs can be a sign of allergies. If your dog is scratching his ears, wiping the ear area on the floor or furniture, has odor in the ear, or redness, swelling or hair loss around an ear, he or she probably has an ear infection. It is important that you schedule an appointment so we may examine, diagnose and treat your pet promptly; improperly treated infections may lead to chronic pain or deafness in dogs. For more information about pet dermatology and common skin conditions seen in dogs and cots, please visit our pet dermatology education page.